Textiles, polymers and composites are increasingly being utilised within the building industry. This pioneering text provides a concise and representative overview of the opportunities available for textile, polymer and composite fibres to be used in construction and architecture. 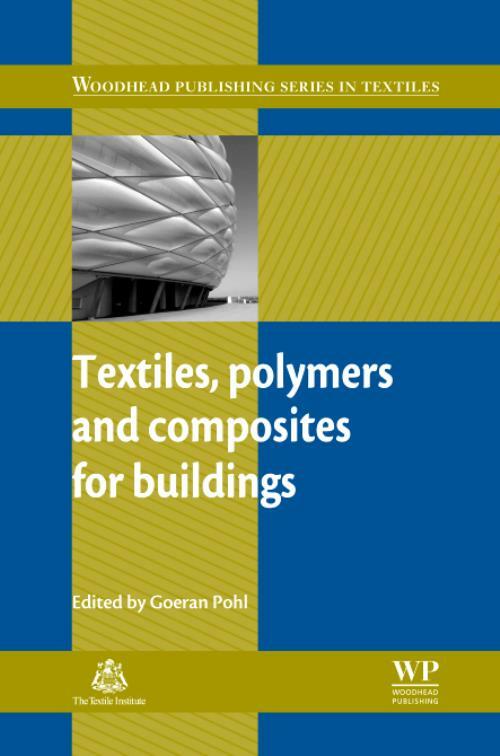 The first set of chapters examine the main types and properties of textiles, polymers and composites used in buildings. Key topics include the types and production of textiles, the use of polymer foils and fibre reinforced polymer composites as well as textiles and coatings for tensioned membrane structures. The second part of the book presents a selection of applications within the building industry. Chapters range from the use of textiles in tensile structures, sustainable building concepts with textile materials, innovative composite-fibre applications for architecture, to smart textile and polymer fibres for structural health monitoring. With its distinguished editor and team of international contributors, Textiles, polymers and composites for buildings is an important reference for architects, fabric manufacturers, fibre-composite experts, civil engineers, building designers, academics and students. textiles for architecture and design; The role, properties and applications of textile materials in sustainable buildings; Learning from nature: Lightweight constructions using the 'technical plant stem'; The role of textiles in providing biomimetic solutions for construction; Smart textile and polymer fibres for structural health monitoring; Textiles for insulation systems, control of solar gains and thermal losses and solar systems; Sustainable buildings: Biomimicry and textile applications; Challenges in using textile materials in architecture: The case of Australia; Innovative composite-fibre components in architecture. Pohl, GGoeran Pohl is Professor at the School of Architecture, University of Applied Sciences Saarland and Guest Professor at the International Master for Membrane Structures in Dessau, Germany. He leads the 'Leichtbau Institut' (Institute of Lightweight Constructions) in Jena, Germany. His research, as well as building experience as a designer, is focused on advanced concepts for sustainable buildings. Professor Pohl's research has led to developments in the fields of textile constructions, fibre-composite structures, shell-systems and bone-like constructions. He has contributed to many publications on biomimetics in architecture and lightweight constructions.